Bike Pirates, (http://bikepirates.com/) have received a LARGE number of smallish bikes, 20″ wheel and smaller (including a unicycle!). The have safety-checked them all and have been giving them out for FREE but still have about 30 bikes left. Can you, a friend, a family member or anyone you know use a kids bike? They are keen to get them out of their shop, as they are closing on January 31 for an annual 10-day cleanup/renovation period and any of these little bikes still in the shop will be scrapped — which is a shame, as they as very usable and they would like to get kids started riding bicycles early. Do you live, work, or travel on King Street? Please join TTC Riders on Monday, November 26 at 7 PM for One Year In: The King Street Pilot! This open meeting is an opportunity to share your experience of the King Street Pilot after one year since its implementation in November 2017. Together they will look at what the data shows about the pilot’s success and engage in a facilitated discussion about the transit priority project’s implementation and impact on our public space and day-to-day life. Register at this link to reserve your spot for this FREE event or at the email below! Light snacks and refreshments will be served and the event space is wheelchair accessible. Do you have any other accessibility needs? Please get in touch with anna@ttcriders.ca and they will do their best to meet them. 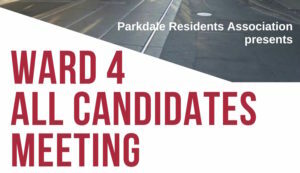 The Parkdale Residents Association (PRA) is hosting a Municipal All-Candidates meeting. 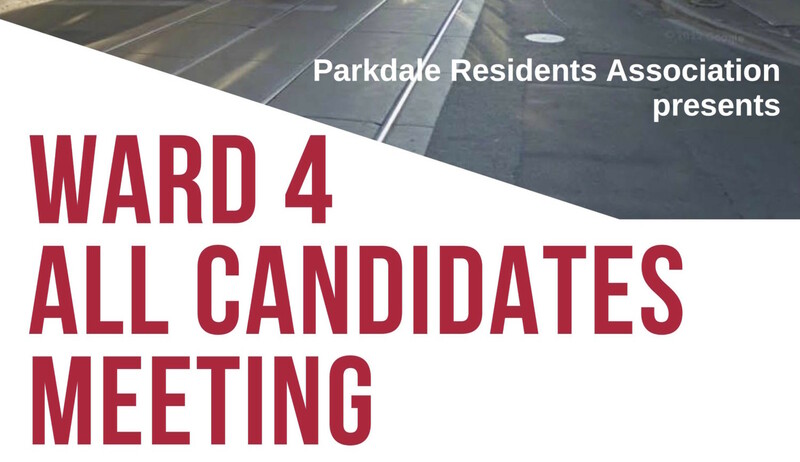 This is Parkdale residents’ opportunity to hear directly from the candidates running for election in the NEW Ward 4 Parkdale-High Park. 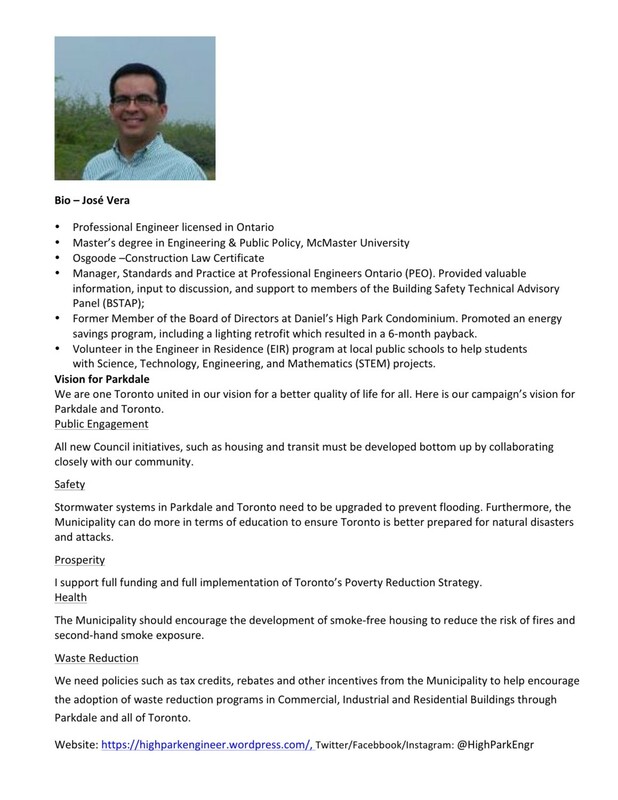 One of these candidates will be our elected representative in Toronto City Council. To prepare for the meeting the PRA attempted to contact ALL the registered candidates. 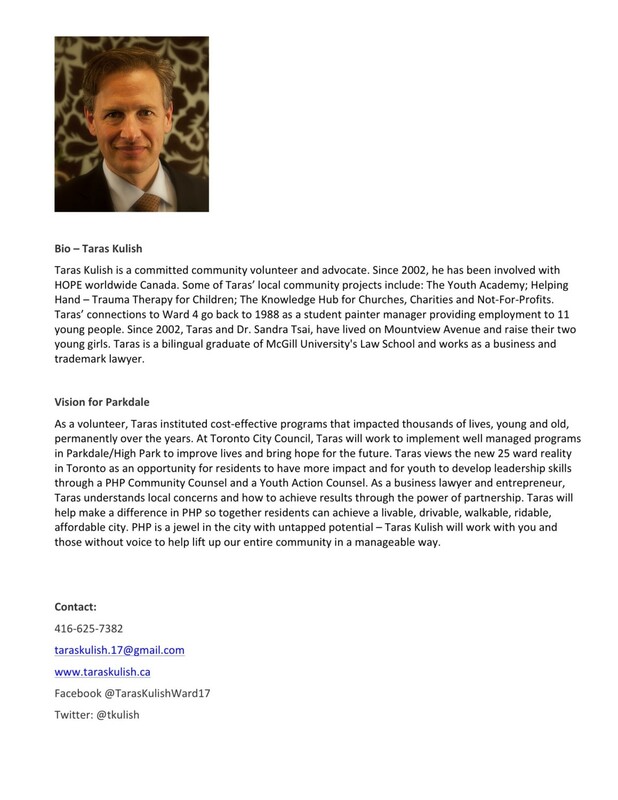 We asked them for a head-shot, bio and to answer one question – What your vision is [for the future] of Parkdale? Six of the ten candidates responded. Please click on the individual’s name for their response – Kalsang Dolma, David Ginsberg, Taras Kulish, Mercy Okalowe, Gord Perks and José Vera. To see a full list of the candidates running in this election for Mayor, Councillor and School Board Trustee(s) click HERE. 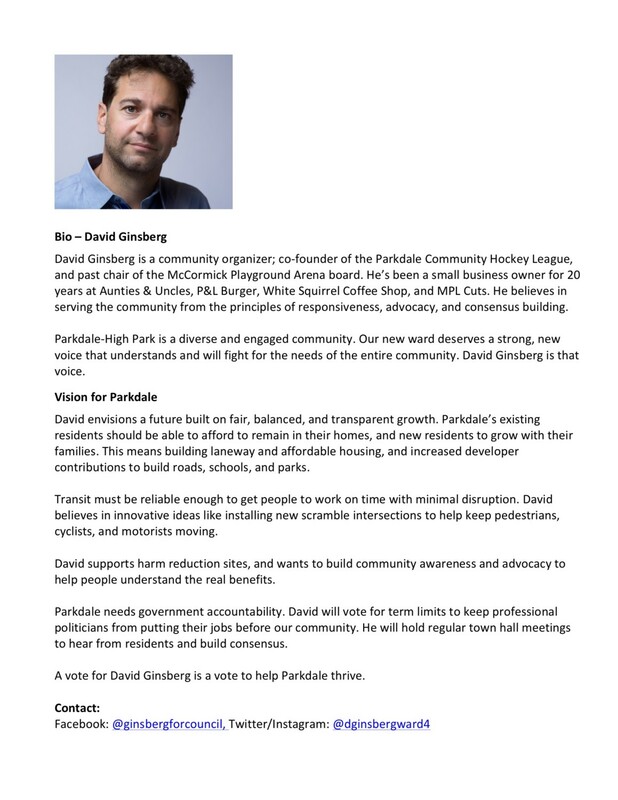 Continue the conversation with your neighbours – #parkdalevotes2018. Advance Voting takes place between Oct. 10th and 14th. In our area you can go to 220 Cowan Ave. (Masaryk-Cowan Community Centre, Activity Room 1) or 100 Queen St. W. (City Hall, Rotunda) – 10:00 AM to 7:00 PM. A community-lead walking tour through the Exhibition Place (AKA CNE grounds) . This 1.5-2 hour walking tour of the Exhibition Place grounds will be lead by Bruce Van Dieten, a member of the community, and will touch on various architectural and historical highlights of the site. Tours will begin at the Princes’ Gates. To see a schedule of summer Sunday dates click HERE. Parkdale Residents Association (PRA) wants your feedback to the development proposal at 6 Noble Street. The PRA is conducting a quick survey of what local residents think of the height of this development in our neighbourhood. Take the SURVEY…we’ll publish the results shortly. Since 1997 the Parkdale Village Arts Collective (PVAC), not-for-profit organization, has held more than 1,400 exhibitions with 800-plus artists and doesn’t show any signs of slowing down. It’s helped the neighbourhood become an art hub for emerging and established artists alike with members from across Toronto. The Parkdale Residents Association is hooking up with the Toronto Parks and Trees Foundation (TPTF) to offer free trees to Parkdale residents. If you own a property or are a tenant (ask the landlord) and want to add a tree to your front or backyard this is your opportunity. The Toronto Parking Authority is in discussion to purchase the land from the provincial government where they will, in the short-term, look to operate a surface parking lot. In the longer terms they are seeking the construction of affordable rental housing units with an included public parking garage. 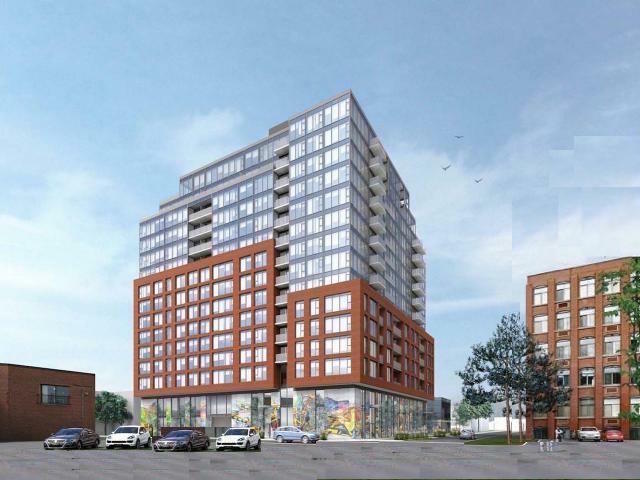 An application for Rezoning was submitted on June 30th, 2016 regarding proposed construction at 57 Brock Avenue. The applicant is proposing to construct a 7-storey residential building containing 106 units and 73 parking spaces. Planning staff will now review the application and will be holding a community meeting in the near future – details of which will be shared when available. An application for a Zoning By-Law Amendment was submitted on September 15th, 2016 from applicant 6 Noble Street Developments regarding proposed construction at 6 Noble Street. The applicant is proposing to construct a 14-storey, mixed use building containing commercial use on the ground floor, with 174 residential units above. The applicant also proposes the inclusion of 76 parking spaces in a below-ground parking garage. Planning staff will review the application and will be holding a community meeting in the near future – details of which will be shared when available. The Parkdale Neighbourhood Land Trust (PNLT) is purchasing its very first piece of community owned land in Parkdale! 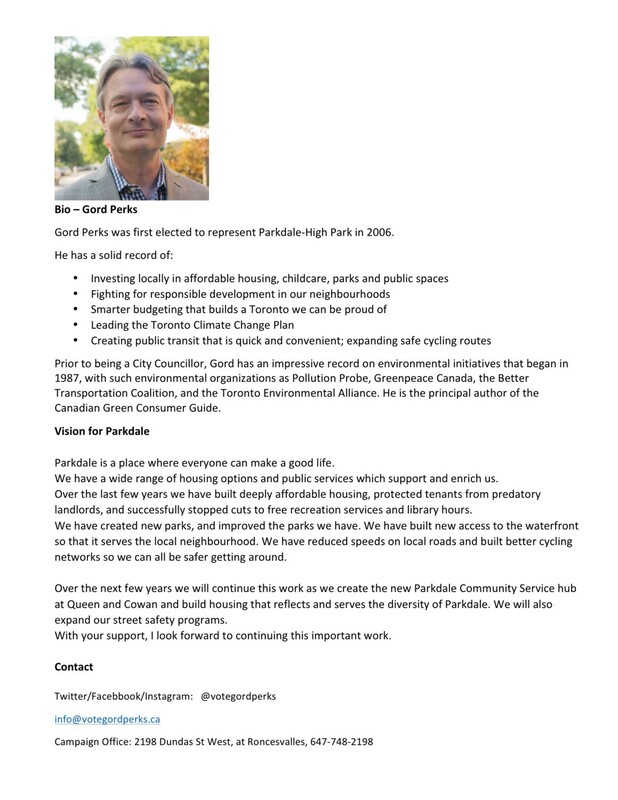 As Catherine Porter announced in her Friday Toronto Star column “generosity blooms in Parkdale” and PNLT has secured a partial land donation from activist filmmaker John Greyson! Now they need your help to complete the deal and make the Milky Way Garden a community owned asset! Join with other community members on June 4th in the Milky Way Garden for an outdoor community potluck, donor drive and screening of Avi Lewis and Naomi Klein’s film about climate change This Changes Everything. FREE & ALL AGES. Pickup FREE leaf compost for your garden or balcony containers!